It sounds like you have embedded the folder as a ‘Quick Folder’, and that does require the user to have their own Google account in order to view. 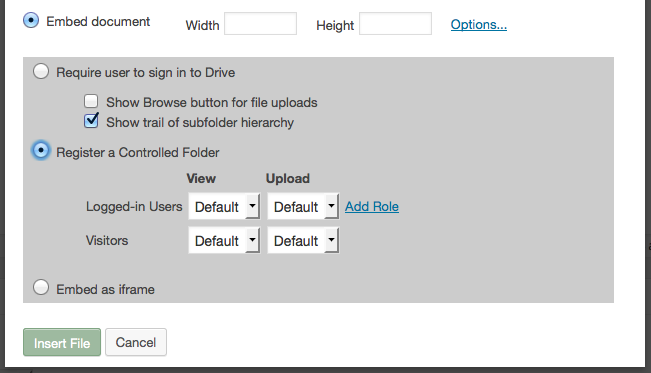 Instead you need to use ‘Controlled Folders’ with View permissions set to ‘Always’ within the plugin. This uses the Service Account behind the scenes instead of the user’s own Google account. 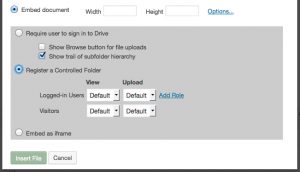 There are more details about Controlled Folders etc in our docs here. And if you first need to configure a Service Account, instructions are here. In Settings -> Google Drive Embedder, go to the Folder Controls tab. The ‘Upload’ column should be set to ‘Never’. You can leave these dropdowns as ‘Default’ and it will pick up the new ‘Always’ defaults that you just set in the Settings page. Alternatively, you could change the View column to ‘Always’ here instead, but of course you would need to do that for every folder that you embed. That’s why I suggest changing the default permissions in settings. Controlled Folders use “cfid” instead of the Drive “id” in the shortcode – that’s how you can see the difference by looking at the shortcode alone. Please note, it still also makes sense to share the folder/files as ‘Anyone with the link can view’ in Drive itself, so users can view the files themselves. The above ‘Controlled Folder’ takes care of viewing the file listings only.